Every company should create Buyer Personas -- fictional representations of their ideal customers. Once you do, you'll better understand your customers and prospects and find it easier to create content for each Persona. The more tailored your content, the more effective it will be in nurturing your leads through the buying cycle. If you're offering the same content to your target audiences regardless of their size, industry, preferences, behaviors, concerns and needs, you're missing opportunities to deepen your relationship. An effective Inbound Marketing program will have content for every type of buyer. Stop investing a lot of time and money in creating content that you make available to all customers and potential buyers. 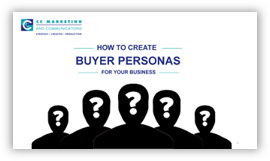 By creating Buyer Personas, you'll discover that you can achieve a lower cost-per-lead and cost-per-customer, and experience higher sales productivity. Download this essential resource today!